SCHOOL VISIT ... Ryan Taylor and Mehdi Abeid with pupils from Wallsend Jubilee Primary School, where they visited with the Newcastle United Foundation on Thursday. RYAN Taylor savours every minute of being a professional footballer. He knows how close he came to having his career snatched away from him after successive cruciate ligament injuries ruled him out for more than two years. Naturally, those horrible experiences have given the 30-year-old a sense of perspective, on and off the pitch. Now back in the first-team picture with Newcastle United after ANOTHER knee injury kept him out of the Christmas period, Taylor simply sees every game now as a ‘bonus’. The will to win remains as strong as ever, but last week, after returning to action as a late substitute in the 5-0 loss at Manchester City, he was able to put things into context. His injuries, quite simply, have changed his entire outlook. He said: “Every game is a massive bonus for me now. I don’t take anything for granted any more. “I go into games thinking, ‘I might not have been here’. I think in every game ‘I don’t want this to be my last’. “So that’s how I go into games. In the past, I might have been a little bit uptight or nervous, but now I go into games and enjoy it, but obviously I want to win at the same time. Taylor and team-mate Mehdi Abeid went back to school on Thursday as part of an educational programme operated by the Newcastle United Foundation. The pair took part in a special Newcastle United quiz with pupils at Wallsend Jubilee Primary School as part of Toon Times, which aims to bring ‘history to life in a way that young people really can relate to’. They also opened a new school gym on behalf of North East teaching agency First Class Supply. Taylor was only too happy to get involved. Again, perspective is everything. He said: “I think you get more enjoyment from it when you do have kids. Mine are three and seven months, so they’ll be at primary school in the near future and they’re going to be in that position. During Taylor’s darkest days, when the endless hours, days, weeks and months of treatment started to take a mental toll, he needed a release. 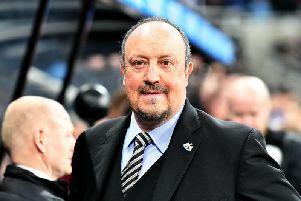 Newcastle got him involved in the scouting side of the game, and that did lead the utility man to consider his future after his playing days are over. That clearly helped, but it was time his family who ultimately got him through it, and helped him make the most of the situation. Taylor added: “I had to get myself involved in different things – family came first. Things that I’ve seen my kids do, I wouldn’t have seen them do if I hadn’t been injured. So I suppose there are positives to being injured. “But I had to keep my mind switched on, which is why I did the scouting. Taylor – who is backing John Carver to take the Newcastle job on a long-term basis – is determined not to let the season drift away as he enters the final few months of his contract at St James’s Park. He said: “I just want to enjoy the next 12 games, go into training every day and to play the next games with a smile on my face and see where it takes me. We can’t let the season just whittle away and we think, ‘We’ll let this season go and kick on next season’. “We’ve got to look at it as a gang of professionals and think, ‘Hold on, it’s a 12-game season and let’s get as many points as we can’.